Students walk past The Grove, formerly Surge III (Karin Higgins/UC Davis). At some point during your time at UC Davis, it’s likely you’ve encountered Surge III. Located in the center of campus, a block down from the Silo, Surge III has been composed of a variety of departments, programs and classrooms. Surge III was originally purchased in 1966, as a temporary building to accommodate the surge of students from the School of Medicine and has since housed a range of other departments, such as Undergraduate Education, Molecular and Cellular Biology, and two general assignment classrooms. After decades of being known as Surge III, the building is getting a new name: The Grove. The new name was chosen for both the little-known grove of majestic pine and redwood trees in the building’s courtyard, and as a symbol for Undergraduate Education, the newest and largest department to call The Grove their home. 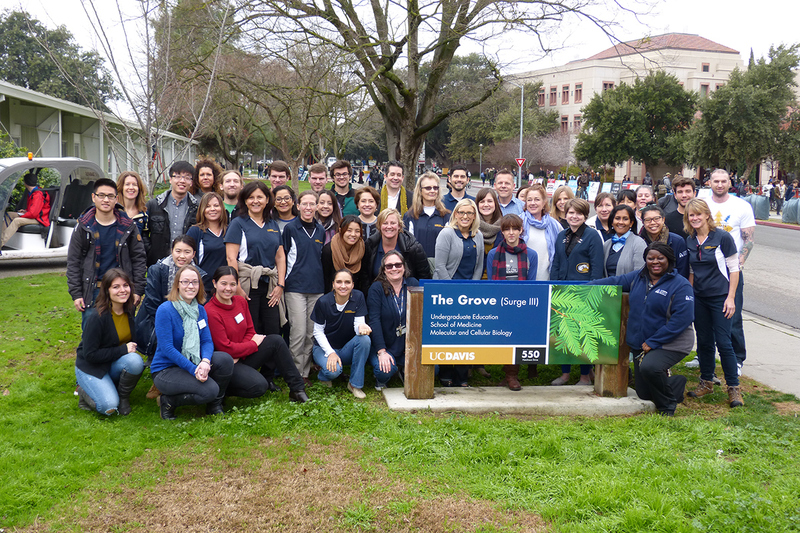 Undergraduate Education staff pose for a photo in front of The Grove, formerly Surge III. The Grove’s new name represents the laying down of fortifiable roots in students’ undergraduate education and the nourishment needed for the growth of every student, as well as the collective nature of the university’s work. Specifically, Undergraduate Education provides administrative services and beneficial programs for students such as the University Honors Program, First-Year Seminars, Entry-Level Writing, International and Academic English, the Center for Leadership Learning, and the Washington Program. Additionally, the department leads interactive training and workshops for professors and teaching assistants through the Center for Education Effectiveness. Lauren Riebs Lauren Riebs is student news editor for the Division of Finance, Operations and Administration.